Despite new sources of liquidity in the reverse mortgage securities market, Reverse Mortgage Solutions remained the largest reverse mortgage Home Equity Conversion Mortgage-backed securites issuer by dollar volume in 2012, representing nearly a third of all issuance over the course of the year. 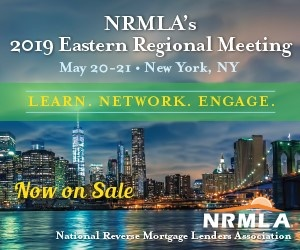 RMS led the pack at near 30% of all issuance, according to data and analysis compiled by reverse mortgage financial services group New View Advisors, followed by Urban Financial Group and Nationstar Mortgage with 23% and 22% of issuance, respectively. RMS was acquired by Walter Investment Management Corp. (WAC) in a deal that closed in late 2012, marking Walter’s entry into the reverse mortgage space. The industry’s dollar total at $8.6 billion represented a downturn from 2011’s HECM-backed mortgage securities total of $9.9 billion, while the number of HMBS pools totaled 628. Due to “tail issuance” or subsequent issuance of additional amounts including credit line draws, fixed term and tenure payments and mortgage insurance premium payments added over time, the pool total in 2012 set a record topping the number of pools in 2011 and 2010 at 498 and 473, respectively. The impact of upcoming Federal Housing Administration reverse mortgage product changes is unknown, but it’s likely that any negative impact on product volume will translate into the investor market for securities, Kelly says. “The bigger risk is if volume falls, is there a certain critical mass to maintain investor interest?” he says. The landscape has shifted, regardless. Of the 10 active issuers in 2012, four are legacy issuers that do not currently produce or purchase new HECM production while Live Well Financial and Silvergate Bank were new additions to the full list that includes Generation, Sunwest, Wells Fargo, Bank of America and Onewest. Most HMBS ultimately end up in Real Estate Mortgage Investment Conduits, or pools of mortgage securities, including much of the issuance in 2012. “The vast majority of these pools will find their way into HREMIC securitizations, and over 350 HMBS pools issued in 2012 have already been securitized (some partially) into HREMICs,” New View writes. View the full report and list of issuers by number of pools and dollar volume as tracked by New View Advisors.